Wash irritated legs with a gentle, moisturizing cleanser, then pat your skin dry. Regular shaving is the most effective technique for people who want smooth, hair-free legs. However, shaving removes the top layer of skin and often causes razor burn, which results in a red or pink rash and bumpy, irritated skin. Although anybody can get razor burn, people with tender, sensitive skin are most susceptible. Dull razors and improper shaving techniques also contribute to the problem. 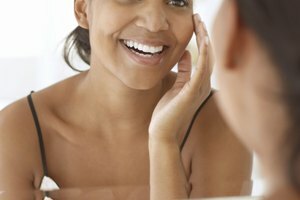 Treat your skin with care and cool the burn with soothing lotions or creams. Apply an ice pack to soothe the burn of red, inflamed skin. Wrap the ice pack in a towel or soft cloth. Place a few drops of tea tree oil or witch hazel on a cotton ball, then smooth the damp cotton ball over red, irritated skin. Tea tree oil and witch hazel are natural antiseptics that soothe and cool the skin. Make a paste of aspirin and water to heal painful razor burn. Crush two aspirins, then blend in just enough water to make a paste. Dab the paste on the painful area. Alternatively, use a thin coating of over-the-counter hydrocortisone cream. 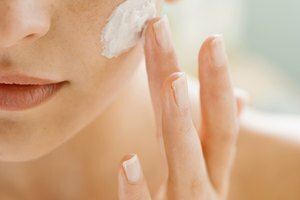 Limit the use of the cream to once per week, as hydrocortisone can thin the skin. Scrub irritated legs gently with a soft cloth if the razor burn itches. Never scratch the inflamed area. Avoid perfume, as well as scented lotions and other products that contain irritating perfume or alcohol. Take a break from shaving, if possible. Shaving irritated skin makes the problem worse. To prevent razor burn, shave your legs with a clean, sharp razor. Rinse hair and debris from the blade between strokes. Before shaving, wet the skin, then apply a fragrance-free shaving product formulated for sensitive skin. Always shave in the direction of hair growth, stroking from your thighs to your heels. Always apply a gentle moisturizer after shaving. Dyer, M.H.. "How to Soothe Legs That Burn After Shaving." Synonym, https://classroom.synonym.com/soothe-legs-burn-after-shaving-6059.html. Accessed 25 April 2019.